In general, Chrono Plus works quite well. I’ve set up several projects, each having several tasks. Very easy with this app’s intuitive user interface. The menubar icon keeps it readily available to select a task (or create a new one), and then to start and stop timing. 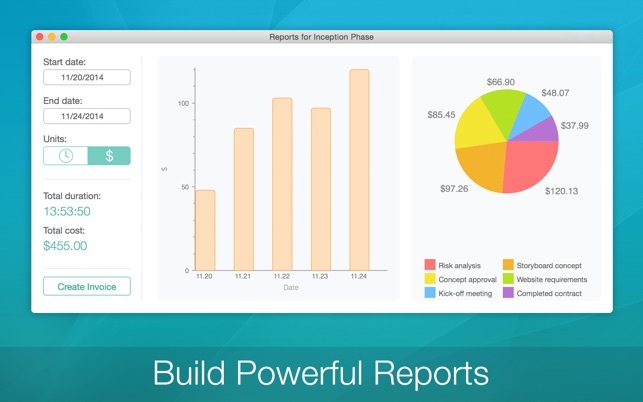 However, Chrono Plus lacks a reporting capability (other than generating invoices). While it is possible to display the history of an individual project and its tasks, or just a single task or “All” tasks (without identifying the projects with which they are associated), there is no way to print or save this information. A simple list and a CSV file would provide lots of flexibility for users to display or report on that information in any way they wish to. Customer Support was great. When I asked about Chrono Plus’s reporting capabilities, Support responded quickly with accurate and relevant information. This is a nice, simple, to-the-point time tracking app. Sits in the status bar and is unobtrusive. 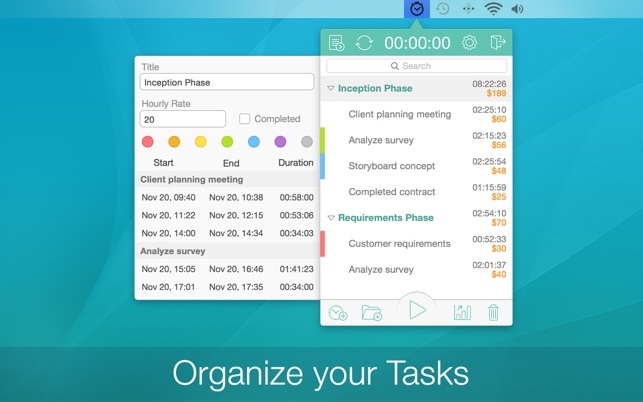 It’s easy to make new projects, add tasks within them, and time your work. You can manually add time entries as needed. And the optional idle-detector works well. The main thing the app lacks is a way to present your timesheet data. You can fill in some fields, and it will export an Excel file for you. But it lacks some details… For example it inserts fields for client IDs and invoice IDs, but doesn’t have any option to keep track of those IDs or increment them for you, so you have to manually keep track yourself. It also, incidentally, presents a very nice-looking breakdown of your time and various tasks within a project, with a multi-colored pie chart and bar graphs and stuff. But you can’t print this or export it to a PDF; the only way to export your projects is to an Excel file, which is all text and not a great presentation. And of course you can make a PDF of that, but it’s not pretty-looking like the internal presentation with the graphs. 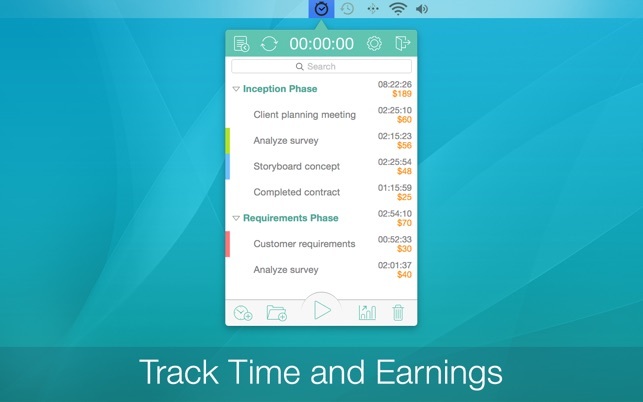 Seems like an oversight; this could be a great app if it had better options for presenting your timesheets, and keeping track of clients and invoice numbers. This app is perfect for what I need. It allows me to create client file folders with project folders inside and to do lists for each project as well. I can track the amount of time spent on each to do as well as each project in two clicks. 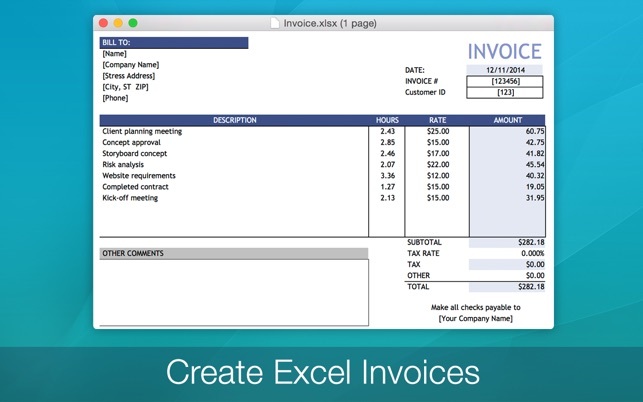 It also multiplies that time per project by my billable rate and generates reports on my productivity based on each to do/project/client and generates client invoices based on that information as well. 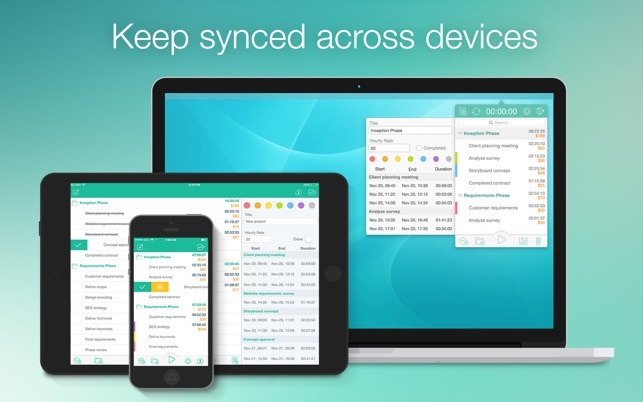 It syncs perfectly across devices and is just as simple and straightforward on every device. The only thing I wish they would add is a column for dates in the CSV file so that my clients can see what days I performed each task.